Insecticide is a hard-boiled, fast-shooting detective game set in a festering future city where bugs have evolved as the planet’s dominant race. 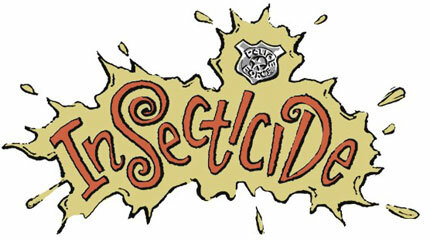 Insecticide will release on Nintendo DS on February 12, 2008, with the first bisodic downloadable PC episode available soon after 26 February. The game will incorporate fast shooter elements as well as being able to conduct investigations and conduct interrogations. 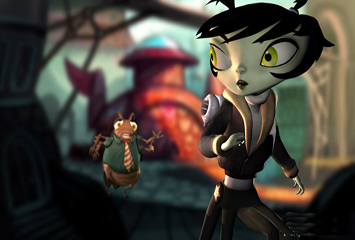 Detective Chrys Liszt: The protagonist and playable character of the game. She is Roachy's partner. She regards everyone with suspicion after a hard life on the streets, relying on her street-smarts, grit, and intelligence. Detective Roachy Caruthers: Chrys's partner. Roachy has served on the police department for 30 years, and is one of the vetrans of the department. Chief Chigger: He's described as the typical screaming, over the top, always-upset police chief, but with a few more limbs to wave around. He has been on the force longer than anyone can remember, and got Roachy to recruit new officers.